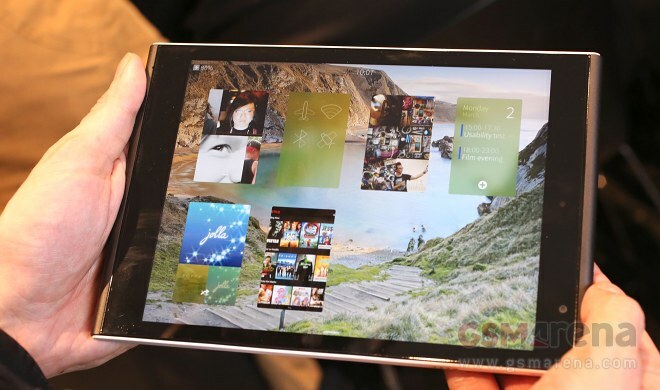 The Jolla Tablet comes with a 7.85” display of 2048 x 1536 pixel resolution which we found to be rather good. Its brightness levels are very high and the viewing angles were great – despite some contrast compression we were still able to make out what’s on the screen even at extreme angles. Reflectivity isn’t quite as impressive and while we didn’t get a chance to try it, we suspect the slate might struggle when taken in the sun despite its strong backlight. The general build of the tablet is really good – the materials feel nice to the touch and the whole thing looks well put together. Styling is pretty cool too – the logos are nicely subtle and there aren’t too many elements so we’d say this is one of the better looking slates out there. It’s not among the lightest though – it weighs as much as the just unveiled Sony Xperia Z4 Tablet and that one is a full-size 10” tablet. As for the Sailfish OS itself, we find its interface rather intuitive on the slate. There are a few gestures you need to remember and you are good to go. Here’s the quick walkthough as provided by one of company’s representatives here at MWC. Powered by a quad-core Intel Atom CPU, the Jolla Tablet performs nicely, although not being quite the snappiest around. We can probably attribute that to the fact that the software isn’t quite finalized yet – we are still over two months away from the moment the device actually ships. Given that there are only a few things that need polishing now, we are pretty confident, it will do pretty well when it hits the shelves. Jolla was particularly keen to point out that Android apps runs as well as if you had an actual Android slate with Sailfish introducing no unnecessary overhead. It’s hard to say that without running a few benchmarks, but it does seem plausible given the performance of the apps that were preinstalled on the demo units. Better yet, the Android apps get their own cards on the homescreen/task switcher so you can enjoy the cool Sailfish multitasking interface with them too. Overall the Jolla Tablet is a pretty cool device that we rather liked even if just because it’s always refreshing to see a new take on smart platform UI. It’s currently available for $219 for its 32GB version on IndieGoGo with a shipping slated for May or June. It’s not the easiest recommendation to make based on its hardware alone and Sailfish still has lots of catching up to do, but if you want to support Jolla’s commitment to privacy (the company is keen to point out it will never sell user data, be it anonymous or not), you might as well take the plunge.